Thomas the Tank Engine an Oppressive Misogynistic Conservative? Who knew that "Thomas and Friends" was such a dangerous influence on children? 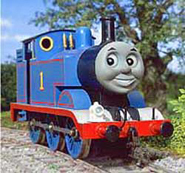 Research by the University of Alberta has chillingly revealed that the kids' TV show Thomas and Friends may be engendering a "conservative political ideology" in future generations - a repressive mindset which "punishes individual initiative, opposes critique and change, and relegates females to supportive roles". Scandalous! "Thomas & Friends" has always been a part of our household, with three kids raised and countless $$$ spent on the wooden train set. I must admit to having my suspicions about Thomas's political views, but I considered them left-wing! The island of Sodor seems to be more of an idyllic liberal utopia! SIr Topham Hatt (the Fat Controller) is the seemingly benevolent commissar who rules the island's publicly-owned railways with an iron fist and a personal stake. He is never held accountable for the "confusion and delay" caused by the outdated and chronically malfunctioning steam engines within his charge. Moreover, he is constantly taking freebies, including extended holidays in the countryside commandeering the trains for his own personal purposes. Just like a liberal! Indeed, it appears that Sir Topham Hatt is the only man on Sodor allowed to own a car. Everyone else must make due with public transport. Again, this is evidence of an oppressive regime. The rails are in constant disrepair causing ever-occurring accidents that plague the rail lines. No doubt this is a result of poor central management and of bureaucrats more interested in lining their own pockets. Lest there be any doubt about Thomas's political leanings, you need look no further than the voice talent behind the series includes none other than Actor/left-wing activist Alec Baldwin! Having become aware of this obvious political agenda, I cannot escape it. I simply have too much invested in the wooden railway to break the habit. Oh well, if Thomas is REALLY of misogynistic conservative, maybe my kids will be OK!